Dell's Inspiron 15 7000-series Ultrabooks, as represented by the 15.6-inch model 7537 Dell sent for this review, are a mixed bag. This model--let's just call it the Inspiron 7537--looks great, has a nice display, and renders games well. Its ergonomics, on the other hand, aren't all they could be; and given the amount of aluminum used in its construction, its chassis exhibits considerably more flex than I expected. Holding and twisting the Inspiron 7537 by its diagonal corners caused the seams between its top and bottom to open slightly. This despite the fact that the laptop weighs in at 5.62 pounds, sans AC adapter. It is handsomely styled in light metal-gray with silver highlights, though, with a black bezel surrounding the vivid 1920x1080 display. Its screen is glossy to facilitate a pleasant and responsive touch experience, but it bounces like mad when you poke it with your finger. This is a problem I've noticed on too many touchscreen laptops. The industry needs to develop a hinge dampener. The Inspiron 7537's physical connections are arranged on either side of its chassis and consist of four USB 3.0 ports, HDMI 1.4, drop-jaw gigabit Ethernet, an SD card slot, and a headset jack--a distinctly modern mix. There's also 802.11b/g/n Wi-Fi and Bluetooth 4.0 on board. Given that this is one of Dell's premium product lines--one notch below its top-shelf XPS--the company should have splurged on an 802.11ac adapter. Performance was very good, though a solid-state drive would work wonders (you can order up to a 256GB SSD as an option). As equipped, the Inspiron 7537's Intel Core i7-4500U CPU and 16GB of DDR3/1600 memory did the heavy lifting to deliver its Laptop WorldBench 9 score of 65. That's about what we see from machines outfitted with Core i5 processors and SSDs. As equipped, the Inspiron's 5400rpm, 1TB hard drive was a bit of a drag on overall performance. Once Windows has cached everything, the overall feel is fine. Gaming performance, on the other hand, proved far better than that of the average laptop, thanks to the presence of an Nvidia GeForce GT 750M discrete GPU (with 2GB of its own GDDR5 memory). It delivered more than 90 frames per second (fps) with BioShock Infinite (with resolution set to 1024x768 pixels and image quality at low), and nearly 40 fps with that game set to resolution of 1920x1080 pixels and image quality at medium). Its performance was even better with Grid 2, where frame rates hit 61 frames per second at 1920x1080 resolution. Battery life of 4 hours and 27 minutes is about the median for laptops with Core i7 processors (at least with our demanding battery rundown test. Your mileage will likely vary). Should you decide, post-purchase, to swap this Ultrabook's hard drive for an SSD, removing the bottom panel exposes the battery, hard drive, and memory slots. The panel is easy enough to remove, but the slight snap of its plastic tabs can be an unsettling experience. The Inspiron 7537 is disappointing from an ergonomic standpoint. Its silver keys with medium-gray lettering are a low-contrast color combination that makes it more difficult than it should be to visually orient and place your fingers. The lack of a delineating gap between the alpha keys and the numeric keypad exacerbates the issue. Both the key feel and sound are soft and uninspiring, but to that you can adapt. The one-piece touchpad is perfectly located, sports tasteful silver trim, and is recessed a millimeter or two for easy tactile recognition. It also sports firm click action, but swipe response was sometimes erratic in my hands-on. Our upscale configuration costs $1150, but you can slip into a lesser Inspiron 15 7000 model for as little as $650 (albeit with a Core i5-4200U, 6GB of memory, no discrete GPU, and a 500GB hard drive). Dell offers Inspiron 7000 models in 11.6-, 14-, and 17.3-inch displays, too. 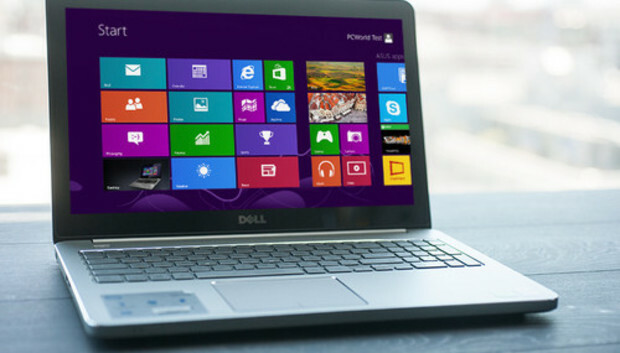 All models ship with Windows 8.1 and a one-year warranty. You can up the warranty to four years for $170.